Although I never met him in person, he and I have an agreement between friends. Asking Al for permission to tell this story...his story...he agreed telling me that divulging his name and location would not be a problem. So, Al, though not in your exact words, I hope I convey the facts accurately. For my readers, I hope you appreciate Al, an experienced, expert Eagle watcher,an invaluable resource to myself and others. Al has a unique setup for observing the Eagles at Webster Lake, MA. Building the nest on a privately owned island, the Eagles, affectionately named George and Martha, have co-exist with the landowners...dog and all. Over the years, Al has seen Freedom, Liberty and Belle all mature and move on and occasionally still sees Freedom. Al, who loves and respects Nature, recently upgraded his methods of observing and actually has a video recorder that he views, monitoring and reporting the activity weekly. Hero, The Story That Needs Telling. When Al viewed last Thursday night's video of the nest, the two chicks he's been watching this year were clearly visible. The next video however, taken the following morning, revealed only one chick. Not wanting to jump to conclusions, he became concerned because his experience has taught him that several things could have happened to the young chick. 2. It could have fallen out, plummeting to the ground below, leaving it injured and vulnerable to predators. Al also knew that if the chick had fallen and was still alive, George and Martha would continue to feed it since they recognize their offspring's cry. But for how long was another question. However, if the chick needs to be rescued and is away from the nest too long, the adults and remaining chick might not accept it back into the nest. Acting quickly and responsibly, by Friday Al had alerted the surrounding property owners, the island owners and the caretaker of the property. Permission was given to search for the young raptor, who would have been fledging in 2-4 weeks. And so it began. It was now Saturday. Later that afternoon, a local couple rang Al's doorbell. They had spotted the chick from their boat and offered to bring Al to the precise location. Grabbing his long handled hoop net and a few moving blankets, they were off in the boat. Spotting the chick, Al saw that it had traveled a good distance (200-300 ft) from the nest tree. Trying to assess it from a distance was difficult so moving in was the only option. Logic told Al that young chick's legs were fine because of the distance it had traveled, however if it had an injured wing, it would be doomed. You see, although George and Martha were feeding it, they might stop once they realized it could not fly and it would die. Should he leave it in the hands of Mother Nature letting nature takes it's course? Wrestling with alternatives, Al also knew that if captured, rehabilitated and returned to the adults, the risk of rejection and abandonment existed. Once again, a crucial decision...the decision to capture it. As they approached, the chick immediately ran, taking cover in the thick brier patch near the water's edge with Al following closely while the others flanked the bird on either side leaving the lake as it's only avenue of escape. Being torn to shreds by the briers, Al continued crawling, moving closer with the long handled net extended out in front. Carefully lowering the net so as not to injure it any further, he was then able to flip over the net causing the weight of the bird to fully be engulfed by the net, it's sharp talons facing upward. Knowing all too well that when an Eagle grabs onto something with it's talons the pressure exerted is both relentless and phenomenal, Al moved methodically and cautiously. Now captured and in the boat, the chick accompanied the three rescuers back to Al's house. Once back at Al's garage, the chick was loaded into a large cage and transported (see Al's photos) by Al and his wife to Tufts Animal Hospital, who was expecting them. Checked for injuries, it was given a clean bill of health by Tufts, although it had seemed to be favoring it's left wing at one point during the chase. During the ordeal, the folks at Mass Wildlife had also been contacted and now it was time for them to pick-up and return the young, now banded, 7.1 pound male raptor to it's island. That was Monday. The decision was made to not place it in the nest but rather on the ground near the nest tree. George and Martha should continue to provide food for it until it learns to fly. As of this writing, it's sibling remains in the nest. 1. It is important to understand that the area the eagle is in is private property and entering private property without permission is trespassing. The owners of this property request their privacy and we ask everyone to respect their wish. 2. The young eagle easily hides itself in underbrush and will not likely be observable from the water. Please keep appropriate distance from the shore to not disturb the eagles or violate the privacy of the property owners. 3. Please do not yell, throw things, or otherwise do things that will disturb the eagles. 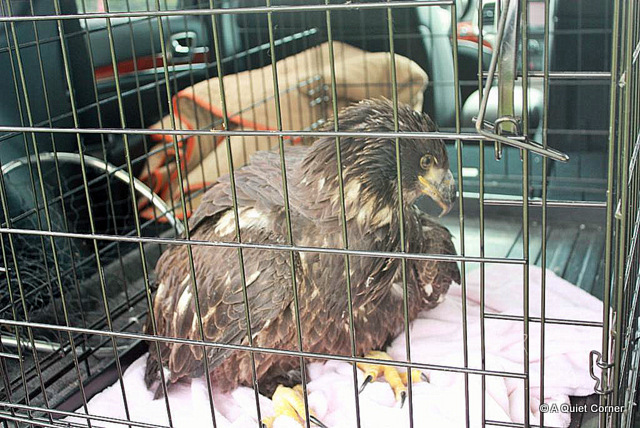 As threaten species, eagles are protected by law and intentionally disturbing them is against the law. We ask all boaters to try to get photos of the boat number of any boats that are disturbing the eagles and report them to the Ma. Environmental Police. 4. The adult eagles will need to feed the young eagle until it can fly to the nest to be fed there. Please do not disturb the adults if they are seen in trees near the ground." Can you see why this story needed to be told? Awesome story! And yes, thanks for sharing! 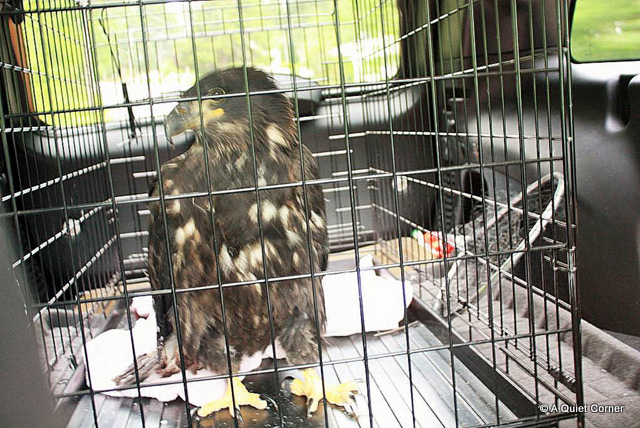 I am glad the eaglet was Ok and I hope it continues to survive. Great photos. Enjoy your day! I love a story with a happy ending JP and am thankful for caring people who watch out for wildlife. Sounds like this youngster has a good chance of survival. What an amazing story. I hope this youngster lives a long and healthy life. Awesome story. Way to go Al. Wonderful story! I just know there will be a happy ending. Great warning to any curious people in that area who may see him. I'm glad Al took matters in hand. Hope all goes well! A great story and hats off to Al. Good luck to this bird. Yes, indeed. And I know Webster Lake. First DH was from Webster and we lived there for a while when first married. Your narration was indeed enlightening and glad you shared it for all to read the story behind it. The photos, tho making me sad to see it caged up, shows there will be a happy ending to it all. Just the other day, our Botanical Gardens, raised and recently released 3 owlets into the wild...the nest was washed out of a tree branch when we had heavy flooding in our area and the nest was saved by a passer-by!!! I love good, happy endings. Yea! I'm glad the youngster will have a second chance at life!